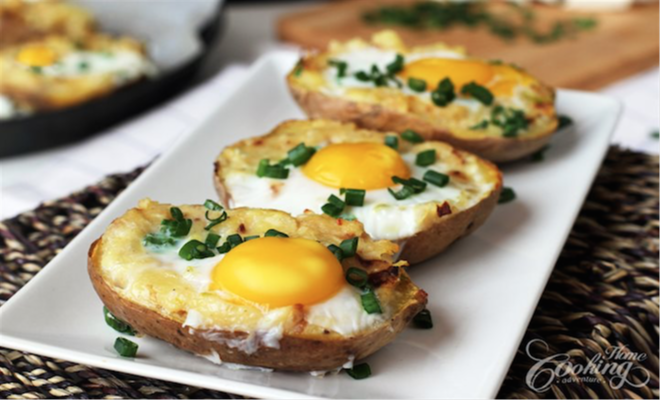 Potatoes are the vegetable that take breakfast, lunch, dinner and snacks to the next level of yum. They are quick to disappear but also quick and easy to buy, prepare and serve. Not only are potatoes uber satisfying, but research published in the Journal of American College of Nutrition also shows that when prepared healthfully, they can be a part of a weight loss program—just call them the 9th Wonder of the World. If you’re looking for flavorful and nutritious dishes that can be part of your weight management plan this new year, then look no further. DIY potato chips: This is a super easy and delicious recipe. Boil a russet potato and a few purple potatoes for 5 minutes, drain, dry and cut into thin slices. Toss the freshly cut slices in one beaten egg white. Spray a non-stick pan with cooking spray and evenly space the chips throughout the pan. Bake slices at 400 degrees F for 35 minutes, turning halfway through. Top chips with sea salt or a sprinkle of bleu cheese. Season with new flavor favorites: Spice up your baked or roasted potatoes with healthy toppings that really raise the bar on nutrition and flavor. Start with a plain, thick and creamy yogurt and a good source of protein. If you’re serious about spice, try adding a tablespoon of Sriracha and orange juice to a half-cup of your yogurt, mix, and add a dollop to your potatoes. Love a Mediterranean flair? Top your taters with Greek yogurt mixed with lemon, garlic, roasted red peppers and oregano. Wholesome mashed potatoes: Mash your potatoes with a low-fat spread, Greek yogurt or skim milk for that creamy, delicious texture you love, without all the extra calories. Slim-belly baked potato bar: Families will love a baked potato bar. Top a baked potato with ground turkey, salsa and light sour cream for taco night, or top your potatoes with tomato sauce, turkey pepperoni, Italian blend shredded cheese and other veggies for a pizza-style delight. Grilled potatoes: Potatoes are the perfect addition to your backyard barbecue menu. Grilling potatoes adds a unique flavor you can’t get from the stove or oven. Create your own spud rub with onion powder, lemon pepper, paprika, sea salt and ground cumin and coat potatoes with a little extra virgin olive oil. Place the potatoes on a grill rack or basket, and within 15 minutes, you’ll have yourself the most spectacular side dish. Customize a nutritious breakfast hash: Drizzle a tablespoon of extra virgin olive oil in a skillet and add diced potatoes (fresh, frozen or refrigerated) with bell pepper and onion, cover and cook on medium heat for 10 minutes. To serve with soft-cooked eggs, use a spoon and make 4 shallow depressions in the hash and carefully crack an egg into each hollowed-out spot. Cover the pan and cook eggs for 5 minutes, or until the whites are set and yolks are still runny, then serve immediately. Alternatively, scramble four eggs and top your hash. For a final touch, top with hot sauce or a sprinkle of tarragon, salsa or chimichurri sauce.